we are expecting foals by him in 2019!! check our 2018 breeding pages. 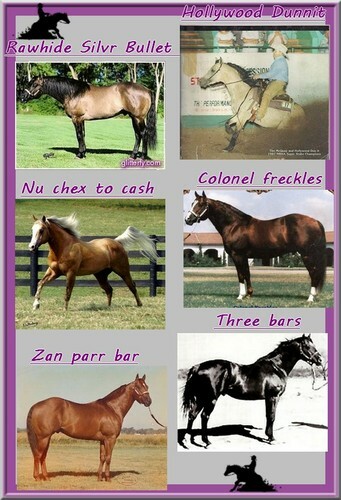 -Nu Chex To Cash: NRHA World Champion, NRHA Hall of Fame, NRHA $2M Sire. -double Three Bars: The leading sire of racing Quarter Horses for many years. American Quarter Horse Hall of Fame 1989. The sire of 29 AQHA Champions, 4 AQHA Supreme Champions, 317 Racing Register of Merit earners, and his foals earned more than $3 million. Stallion services limited in 2018. Stallion service Fee to be declared. Pictures of his family tree heritage below.